Kickstarter, the crowdfunding platform for creative projects, reached a big milestone today: it’s now racked up $1 billion in overall pledges — with 5.7 million of us behind the effort, according to a special stats page it’s created to mark the moment. We’d been tracking the ticker and noted yesterday that it looked like the $1 billion mark would be passed any day now. The growth comes in the wake of more sobering news from the company: two weeks ago, it revealed that it had suffered a security breach in which malicious hackers had tried to gain access to user data (it noted at the time that there was no evidence of any credit card data getting picked up, although it did say that two accounts had unauthorized activity logged on them). According to the company’s statistics page, its $1 billion in total funds works out to $859 million to back successful projects — the $1 billion represents money towards all projects, including those that are still in progress or didn’t meet their funding goals. To date, there have been 57,121 successful projects on the platform. With Kickstarter taking a 5% cut on a successful projects, that means it has collected just under $43 million for the effort. But while Kickstarter as a platform is going great guns, it’s important to note that it’s not always a case of rising tides lifting all boats. There have to date been 74,042 unsuccessful projects on the platform. And nor do the stats tell the story of how many projects that are successfully funded ever get made. One study published earlier this year by Evil as a Hobby charting the delivery rate for all funded games between 2009 and 2012 put the percentage of those that have seen full delivery at just 37% — although Kickstarter has not released official numbers itself. A study from 2012 found that 75% of projects in the tech and design categories see some kind of stall, although we understand that a majority of the projects eventually do get completed. The march to $1 billion has been led in large part by backers from the U.S., where Kickstarter is based, with some $663 million in pledges coming from that region. 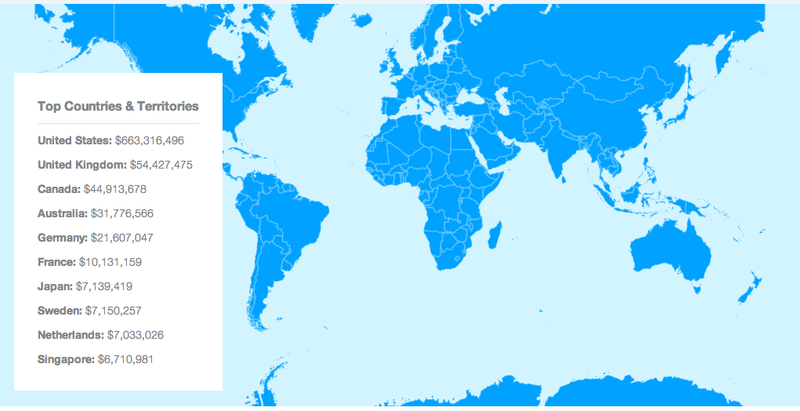 In total, the platform sees contributions from 224 countries. The startup has seen a massive acceleration in terms of interest from users — both with projects getting posted and people coming to fund them. Some $500 million in funding was accumulated in the last 12 months alone. 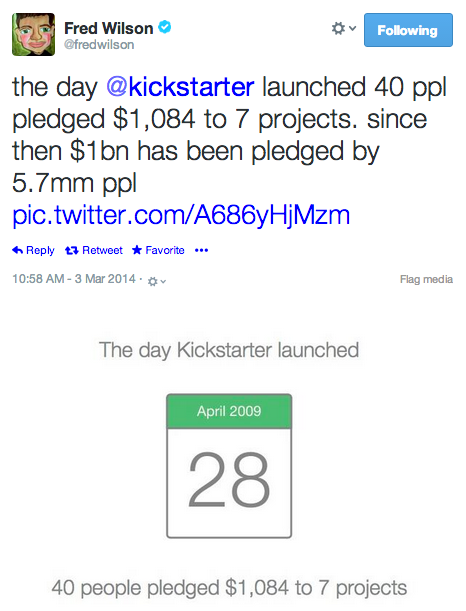 It’s come a long way: as a point of comparison, Kickstarter investor Fred Wilson of Union Square Ventures notes that on its first day of business, on April 28, 2009, it saw seven pledges for a grand total of $1,084. Kickstarter, which sees people looking to raise money for projects like films and music albums through to new innovations in hardware, has developed a loyal following among those who back entrepreneurs and artists there. The company notes that some 1,689,979 people have backed more than one project; and some 15,932 people have backed more than 50 projects. Interestingly, although films account for the majority of launched projects to date (33,471 in total), it’s games (one of the smaller categories at 8,750 projects) that has seen the biggest success in terms of money pledged. Games have picked up $215.7 million in total funding, with $189.8 of that “successful dollars”, with a success rate of around 35%, or at the low end of the spectrum. Kickstarter may be the most well-known of all crowdfunding platforms, but it certainly isn’t the only one. Competitors include Indiegogo (which recently raised $40 million to fund expansion), and fuelled by regulatory developments like the JOBS Act, we’ve seen a many others enter the fray.